*Barbara, known as The Dancing Spirit of RI lives in Tiverton where she owns and runs The Dancing Spirit Studio . She began dancing in Rye NY at age 4.She choreographed her first group dance for twenty kids at age 16. She attended The Washington School of Ballet and The Professional Children's School, NYC. She received her BFA in Dance from SUNY,Purchase. After college Barb then a Modern-Ballet Dancer performed with Grethe Holby, Takako Asakawa Dance Co, Dibble Dance and others while studying Ballet with Finis Jhung. In Colorado she danced with The Nancy Spanier Dance Co.Mark and Barbara moved from NY to RI to raise their three kids. Barbara co directed The Tanagra Movement Theatre Company for 5 yrs with Michelle Bach, Head of The Brown University Dance Dept and opened The Dancing Spirit Studio #One at Tiverton Four Corners for children, adults, ballet, modern, creative movement and Pilates. *Barb fell in love with Belly Dance in 2001 in a class at a Y.She has studied with some of the best Middle Eastern Oriental Belly Dance teachers and performers in the world. Her teaching and performance style is a fusion of all the dance forms she has studied throughout her life. She has presented many performances around Newport County and sometimes performs in NYC with Morocco, Dalia Carella and Anahid Sofian. Barb performed in Hawaii with Delilah, in Turkey, at Tayaar's Music & Dance Camp with Sema Yildz, Lee Ali and Nourhan Sharif .She taught skirts & zills and performed in Bali with Samra, in Sayulita, Mexico @ Haramara and was with the luminous 2nd Theatrical Belly Dance Convention, NYC. *Barb brought International Shimmy Mob to RI in 2011 celebrating National Dance Week, World Belly Dance Day and International Shimmy Mob together. May 9, 2015 was her studio's 5th Shimmy Mob, which featured her own choreography shared on five continents. The performance of many dancers included live music by Margerate Ferri, a reading of The Dancer by K. Gibran by scholar Brian Sullivan and a live painting by Courtney Cartin.Together everyone rose funds for The Women's Resource Center of Newport. September 19th,2015 on World Peace Day, Barbara shared a Dancing Spirit Peace choreography inside and outside with a special gathering of peaceful dancers. *Nov 19th, 2015 The Studio hosted a hafla fundraiser for Syrian refugees accompanied by Charlie Hallals band. Barb's Shimmy Mob story is on DanseTrack http://dansetrack.com/barbara-donahue-shares-her-love-of-dance-for-a-worthy-cause/ Barb has been performing solo and with groups for SOAH ( Singing out against Hunger ) presenting the only dance for 12 years at Everylyn's seaside tent and has brought the only dance to The Tiverton Four Corners Arts Festival for 18 yrs.The Tanagra Troupe brought the only dance to the Newport Rocks Series at Fort Adams, Summer 2014 *Barb says, "I never imagined I would become a Belly Dancer. I never knew anything about the dance form or the complex world history .I have said many times it is the gift that keeps on giving. Belly Dance can grab you. Learning the technique, skirt work, veil grace, rhythms, finger cymbals and the earthy feeling can add much expression to any dancers repetoire. Belly Dance is classical, traditional folk dance and fusion which blends and encourages the dancing spirit in everyone .I love watching students as they learn and grow in wonderful blossoming and expressive ways." Welcome to Belly Dance passion. I am originally from Rye, NY. I've been dancing since age 4. I choreographed my first group piece for 20 kids at age 16. Ballet, Modern Dance,S.U.N.Y. Purchase. After college I performed in several modern dance companies in NYC and Colorado. My first Dancing Spirit Studio was at Tiverton Four Corners where I taught Ballet, Modern Dance,Creative Movement for children age 3 up through adults. I was going to stop dancing and get my masters at Salve in art therapy when I took my first Belly Dance class at a Y and it grabbed me by the heart and soul. I opened my second Dancing Spirit Studio at 1759 Main Rd in the " Hub" of Tiverton. For 8 years there I taught classes for all ages and produced many wonderful shows. When I first began studying Belly Dance I was in my backyard studio. I have returned to the backyard studio. My classes are for children through adults. All students ages teen through adults learn belly dance basics including zills, skirt work and veils. My style is refered to as Belly Dance Fusion as I mix styles and music genres. For 14 years The Dancing Spirit Studio has brought the only dance to The Tiverton Four Corners Arts Festival and to SOAH at Evelyn's ( Singing out against Hunger). This year I am the fifth year team leader and one of the choreographers for International Shimmy Mob a global fundaiser for womens and childrens shelters.The show on May 9 will be held at The SandyWoods Center for the performing arts. Last summer 2014 Tanagra performed in Newport at Fort Adams for The First Newport Rocks the fort series. Oriental Middle Eastern Belly Dance ( Raks Sharqi, Egyptian classical name) is mainly from the countries of Egypt, Turkey, Lebanon but it is danced all through the Mid East ( and Persia) and has Indian and Flamenco influences.The styles are sometimes referred to as gypsy, cabaret, american tribal style, ATS, tribal fusion,Gothic tribal.. Belly Dance is a globally loved dance form but it has a funny name ( misnomer) which makes it quite misunderstood by those who don't grow up in the culture of it or who never take a class. A Pro Belly Dancer knows technique, rhythms, finger cymbals, veil work, skirt, cane ( sometimes dance with chamadans and snakes). Belly Dance can be hard to find and unknown ( I own one of the only Belly Dance studios in RI) by much of the classical dance world ( I didn't know about it). The costumes( if you don't know your mind thinks ? ) and the funny name Belly Dance ( Who dances with their belly?) throw many off. Mid East Dance has existed since the beginning of time.When I realized most USA Dance education does not include Mid East Dance I became a crusader. Many passionate belly dancers become crusaders. Basic beginning steps are folk dance steps danced at many celebrations around the world.The next level is pro, many times soloists. Dance & non dance students come to my studio for fun but they also learn focus, concentration,grace, musicality, confidence, posture, technique, strength, practice & discipline & fortitude. If they are grabbed the way I was they begin a journey I call blossoming. Since the age 4 my dance models were ballerinas & Isadora Duncan. When I discovered Belly Dance I fell in love. I love the creative freedom of Belly Dance. I always urge my students to experiment with steps,styles,music & costumes, blending all dance movment forms with Mid East flair for a fusion evolution. Blanca, a good dance friend said " Belly Dance grabs you" and it's true. If you are ready, you want to learn as much,as fast as you can, but as you learn, you open many unknown, undiscovered fun doors which is the journey. A special aspect of Belly Dance is that it is very feminine but earthy at the same time. It also is educational in many fun and surprising ways. Belly Dance is an expression of joy and celebration. The Dancing Spirit style is a combination or fusion of styles I have studied and mix together. I love to fuse this and that to see what I and my students can create that is new and different but I also love tradition and classical styles. 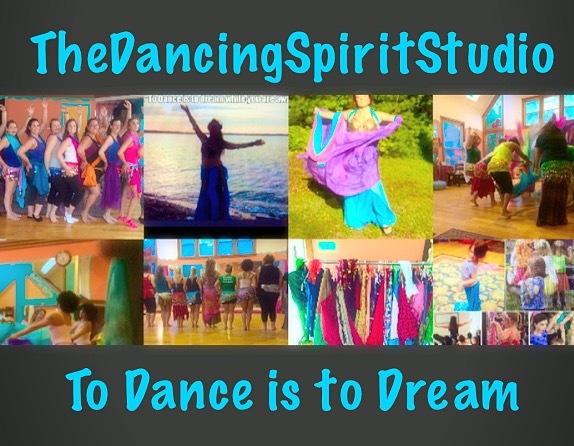 June 2011 The Dancing Spirit Studio became the only RI Belly Dance Arts studio in Newport County . One of my favorite mottos is, “If you dance for five minutes a day you will be happier, healthier & friendlier.” Don't you agree? Dancing Spirit classes are for children through adults. All students teen through adults learn belly dance basics including zills, skirt work and veils. My style is refered to as Belly Dance Fusion as I mix styles and music genres. .
Dance & non dance students come to class for fun but they learn focus, concentration,grace, musicality, confidence, posture, technique, strength, practice & discipline & fortitude. If they are grabbed the way I was they begin a journey I call blossoming.